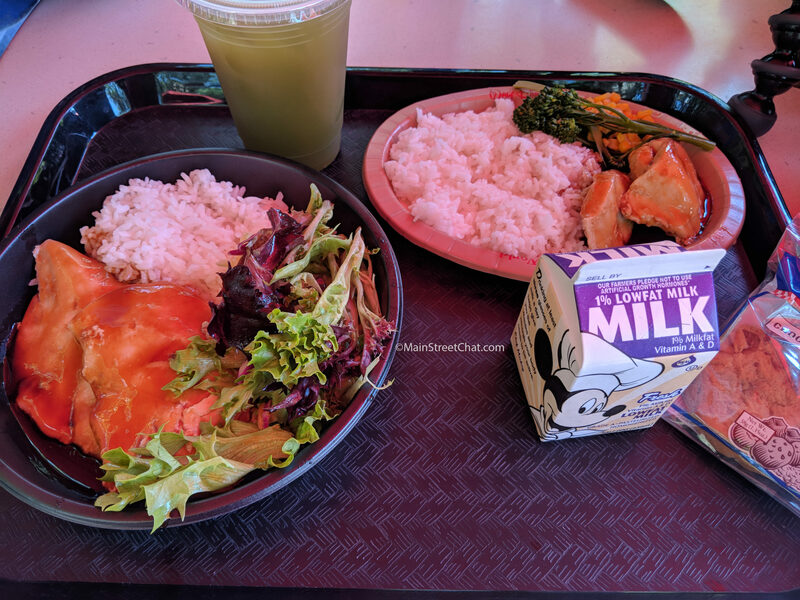 Katsura Grill can be found at the Japan Pavillion in Epcot. This quick service location is both picturesque and tasty. One of the huge bonuses about Katsura Grill is that a lot of people don’t even know that it’s there because of its location. 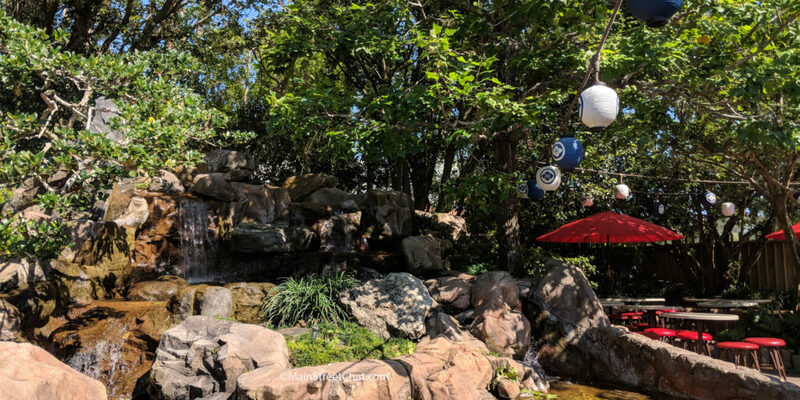 It’s tucked away into a little corner in the back of the Japan pavilion. The menu is somewhat limited but it does have some great classics. The World Pavilion opens at 11 so Katsura Grill is open for lunch and dinner. Sushi is available but from previous experience I’ve got to say it’s really not all that great. It will make do if you really want it but it’s really like grabbing it from the grocery store. Plates include classics like chicken teriyaki, chicken katsu curry, and beef teriyaki. You can also get ramen and udon. For us the stand out items are the chicken teriyaki and the ramen. It’s so good. You can also get really good green tea here and the deserts are also great. The only complaint we have it that the desert portions are extremely small for the price you have paid. Nevertheless, items like the Green Tea Cheesecake were delicious. Katsura Grill is one of our favorites but sometimes things can be awkward here. For example this last trip I (Elyse) ordered our food. Meanwhile, Adolfo was finding us a place to sit outside and had taken Kaitlyn with him. After ordering you wait for them to get your food ready and they call your order by number. I got the order and took it outside. Once there I noticed that we had only gotten two out of three items. I went back inside and very politely told the staff that we hadn’t gotten one of our items. Mistakes can be made so always be polite and always check the receipt. Occasionally, at Epcot, there can be a language gap. Sometimes orders can be taken wrong. No biggie. They immediately insisted that I had gotten all of our items. When I insisted that we hadn’t they demanded to know where our tray was. This was done with a lot of attitude and they clearly didn’t believe that we were missing food. I repeatedly said that I had taken the tray outside to my hungry toddler. They were actually going to make me go outside with a cast member to prove that an item was missing. A few minutes into this discussion another customer came up with a bowl of Ramen. They explained that they hadn’t ordered it and it must be someone else’s. Funny, that’s what was missing from my order. Then the staff told me that they would get me another bowl without so much as an apology. This is a real let down for us. We don’t exactly like being accused of trying to get free food out of the restaurant. We also don’t like feeling like someone thinks you aren’t a trustworthy customer. Customer service like this at Walt Disney World is completely unacceptable in our eyes. In all fairness this quick service is not run by Disney. However, we still firmly believe that they should be held up to Disney standards if they are going to be doing business in a Disney park. Besides this occurrence, the food was good as usual and it was a nice day out. 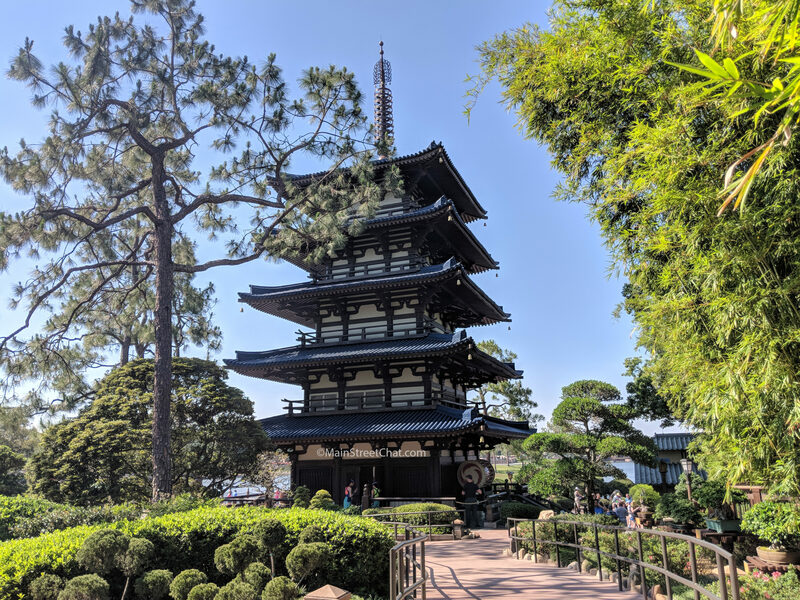 Sitting outside in the garden was lovely and is one of our favorite places to unwind in World Showcase. It’s also a great spot to listen to the drum show. While you can’t see it from Katsura Grill, we still enjoy hearing it. We ordered an adult portion chicken teriyaki, a child portion chicken teriyaki, and a Tonkotsu Ramen. The Chicken Teriyaki is a staple for us and we order it pretty much every time we eat at Katsura Grill. The teriyaki sauce is much lighter than what is typically served in American resturants. It’s consistency is pretty watery. It also comes with steamed white rice and salad or corn (for the kids option). This is so good and not overly heavy on a hot day. 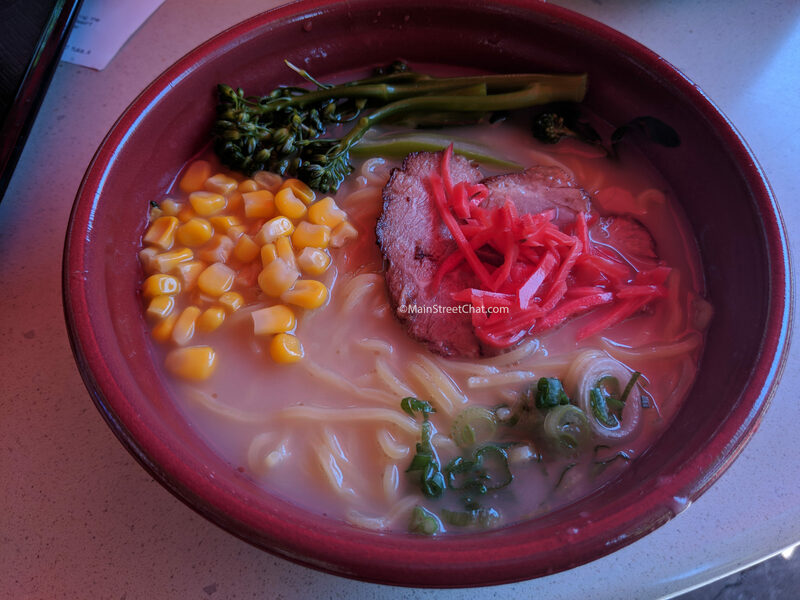 The Tonkotsu Ramen is hands down Elyse’s favorite item on the menu. It has a little spice to it and the portion is very small for Ramen but it’s delicious. The pork is seasoned perfectly. Green Tea is a staple at Japanese restaurants. This one is absolutely perfect and we always end up going back in to order more after the meal is done. 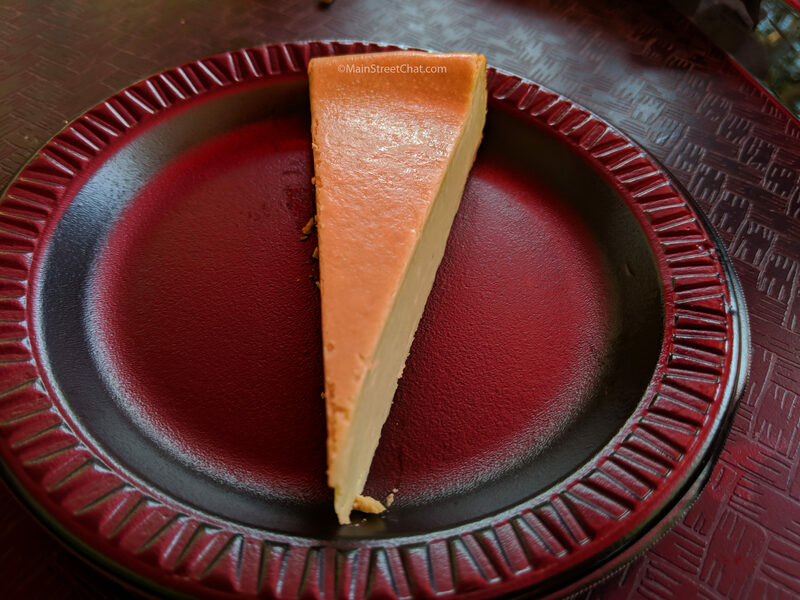 The green tea cheesecake is the one item we are going to say to pass on. Although it taste’s great the portion is horrifically small for five dollars. Honestly, it’s pretty much a complete rip off. Save your money and go over to Karamell-Kuche to get something delicious for desert. Should you go out of your way to eat at Katsura Grill? If you really want some Japanese style food, sure. It’s a favorite for us because we eat a lot of Japanese food when we are at home and it’s a staple for us. One of the biggest reasons we eat here often is because it’s not crowded and we really love the outside atmosphere. It truly is in a beautiful location.